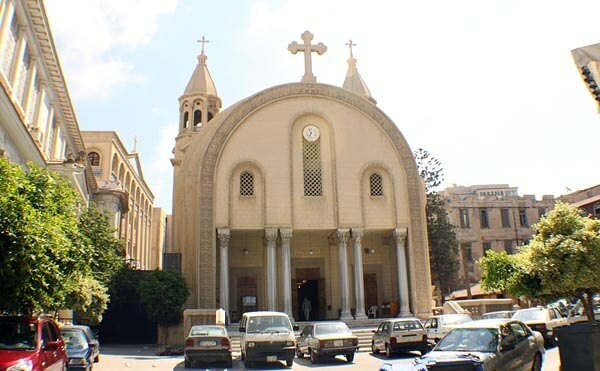 The gorgeous Saint Mark’s Coptic Orthodox Cathedral in Alexandria, Egypt, is the historical seat of the head of the Coptic Orthodox Church, the Pope of Alexandria. Its vast interior is filled with graceful, elegant arches. Chandeliers hover above the pews, casting light upon a glorious rendition of The Last Supper above the altar. Additional artwork showcases Coptic engravings, stained glass windows and paintings of scenes from the life of Jesus Christ and the Apostles. Though churches at this site have been destroyed and rebuilt several times over the millennia, the cathedral is believed to stand on the same site where St. Mark the Evangelist, author of the second Gospel, first founded the church in 60 AD. The most recent rebuilding occurred in the 1950s, and the cathedral was enlarged again in the 1980s. The basilica retains two pre-existing minarets. Six marble pillars were repositioned beneath the arch of the western entrance. Last updated by Mike on 14 August, 2011 in Destinations.